The buds look like the rose will be normal when it opens but there are never any petals. It is just sepals on top of sepals on top of more sepals. Usually sepals come together to form the "holder" of the flower. This holder is called a calyx. But, the Green Rose never makes the flower part. No flower, then no seed and no next generation of rose plant. Thus this plant only exists due to the kindness and love of gardeners who take cuttings and make more roses. It often has great sentimental value to those who grow it because it may have been a gift from a friend. Considering it is first recorded in the mid 1800's that is a lot of love keeping a sterile rose with no real rose flower going. 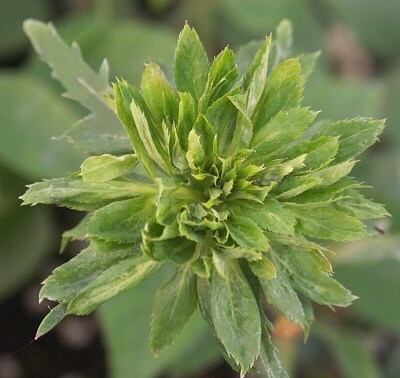 Green Rose is thought to be a descendant of Old Blush which is a two hundred year old form of Rosa chinensis. China roses are extremely hardy. 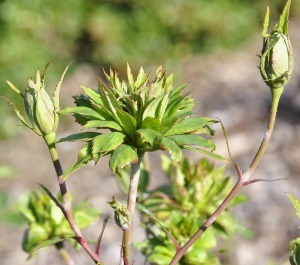 In fact, many winters, here in zone 8, the Green Rose never loses its leaves but remains vibrant green with a tinge of red which is a welcome addition in a miniature rose garden full of naked stemmed bushes. 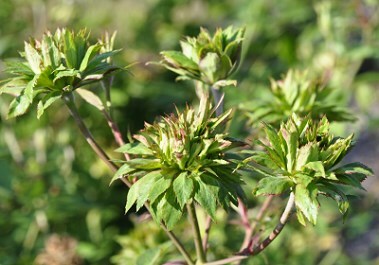 Like all roses, the Green Rose is sun loving and fairly drought resistant. Plant in well drained soil and fertilize with an organic fertilizer in the spring. We prune out dead canes whenever we notice them and shape the plant to the height and width we want in fall.